The HumPRO� Series is a Frequency Hopping Spread Spectrum (FHSS) transceiver designed for the reliable transfer of digital data. It has a very fast lock time (<60ms typ) so that it can quickly wake up, send data and go back to sleep, saving power consumption in battery-powered applications that have strict power budgets. Built on the Linx Hummingbird platform, the module is below $9 in volume, effectively competing with discrete designs. The module employs a fast-locking FHSS system for noise immunity and higher transmitter output power as allowed by government regulations. It handles all protocol functions automatically and has options for acknowledgements, Listen Before Talk (LBT) and assured delivery. Multiple hopping patterns enable multiple systems to operate in proximity with minimal interference. All modules have a unique 32-bit serial number that can be used as an address. Additional address modes support customer-assigned 16 or 32 bit source and destination addressing. The addressing methods support point-to-point and broadcast links. Address masking by the receiving module allows for creating subnets. More advanced network methods can also be implemented with an external microcontroller. A standard UART interface is used for module configuration and data transfer. A few simple serial commands are all that are needed for configuration. This is suitable for direct connection to UARTs on many microcontrollers, USB converters and RS-232 converters. 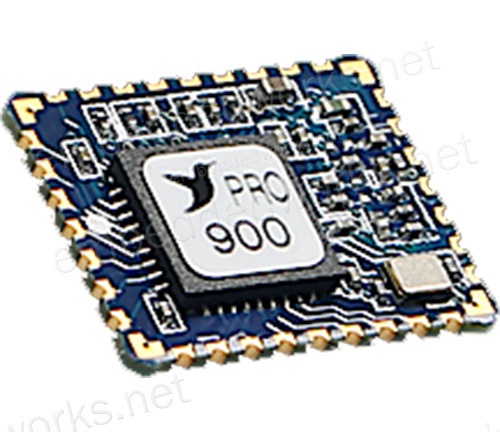 The HumPRO� 900MHz version outputs up to 10dBm, resulting in a line-of-sight range of up to 1,600m (1.0 mile), depending on the antenna implementation. The HumPRO� Series transceiver is available in a non-certified version and in pre-certified versions with an RF connector or an antenna. The non-certified module allows more freedom in antenna choice and placement. The certified versions restrict the types of antennas that can be used, but eliminates the need for costly transmitter certification. 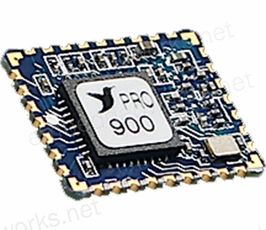 Housed in a tiny reflow-compatible SMD package, the transceiver requires no external RF components except an antenna, which greatly simplifies integration and lowers assembly costs. Custom features are also possible with the HumPRO� Series remote control transceiver. Contact Linx for more details on customization. The fast lock time, small size, low cost and low power make the HumPRO� ideal for networks and sensor nodes that have very tight power budgets, such as water meters, remote weather stations and Internet of Things (IoT) applications.